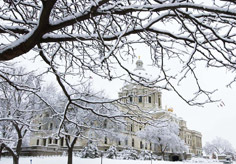 APWA-MN Chapter members will want to take note of several issues of importance during the 2014 Minnesota Legislative Session, which gets underway on February 25. The proposed legislation was passed by several committees in the House and Senate, but failed to be enacted in the final hectic days, 2013. Please take a look at the draft legislation as it’s another tool for public works to accomplish needed improvements. In particular, take a look at the list of cities that have passed support resolutions. If your Council or mayor has not done so, please do as time is running out. Learn more about the legislation in this summary by the League of Minnesota Cities. Wow, what a package of $986 million for infrastructure. Clearly there is something to like in this package for most chapter public works members. The asset management focus is particularly interesting statewide. Learn more about the proposal in this summary by the League of Minnesota Cities. Don’t feel bad, we didn’t know what this meant either, but likely you’ll hear more about it this week from the governor’s office. Unsession basically means undoing stuff (statutes, rules, guidance, etc.). The governor asked State Fair attendees last summer for input and received 1,500 suggestions. Late this fall, the executive office directed state departments to find a 30 percent reduction in such items and provide answers by end of this month. Do you have ideas? Learn more here. Stay tuned! MnDOT has really struggled with the unsession directive as likely have other departments, agencies, and boards. Some changes could happen by executive order, some will require legislation. Legislative leaders expect a short session, but this matter probably will not go away quietly. Joel Schilling serves on the APWA-MN Communications Committee. Dave Sonnenberg serves on the CEAM Legislative Committee.